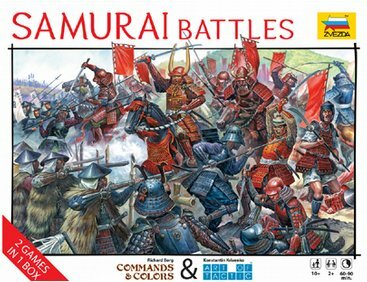 You may remember that last year, Zvezda (the Russian plastic miniature manufacturer) released Samurai Battles, a game for their Art of Tactic rules, which also included a variant for Commands & Colors. Well, they have just announced a sequel box set: Samurai Battles: Ninja Attack. 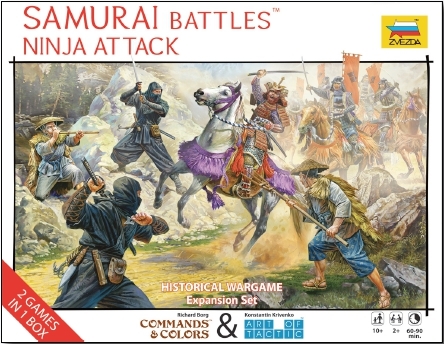 This game includes new miniatures – not only the aforemention Ninja, but Samurai bowmen, both mounted and on foot – along with new battle boards, terrain and new scenarios for both game systems. According to Plastic Soldier Review, Zvezda’s releases for the game this year will also include several monk units as well as Yari armed Samurai, who were strangely missing from the initial release. Whilst two new 28mm ranges of Samurai have recently been announced, from Steel Fist Miniatures and from North Star Military Figures, and with Osprey releasing a set of Samurai Skirmish rules later this year, there has perhaps not been a better time to enter this period. The Samurai miniatures from Zvezda now offer a very good and cheaper alternative, should you so wish.